$199,900 CAD Definitely worth exploring!! Style: Lot / Land "subject to HST payable by Buyer"
Lot Size: 2.24acres 304ft x 452ft "304 feet of excellent shoreline"
Accessible by road all year long, Dean's Island on Whitefish Lake is one of the most unique areas along the Rideau waterway. 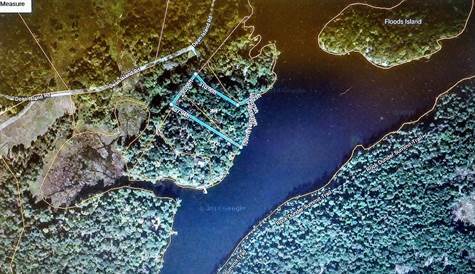 Private & well treed, this 2+acre lot features an elevated building site with amazing southeast views - a sloping 'path' that leads to a flat, level strip that runs along the entire shoreline - and 300' of clean deep waterfront perfect for swimming & boating. Just a couple of kms off Hwy 15 & directly across from the hiking trails at Rock Dunder (read more at http://www.twprideaulakes.on.ca/heritage/nathist-rockdunder.html) Pre-approved for septic & building. A very rare property that is definitely worth exploring!! ++ Hwy 15 to Jones Falls Rd - to Deans Island Rd. Travel 1km +/- & over causeway to Dunder View Lane & pin# 284. Whitefish Lake - Rideau System. ▪ Opposite Rock Dunder Trail - a steep precambrian formation of granite that rises 90M above Morton Bay. Check it out at http://www.explorethearch.ca/hike-the-arch/hiking-trails/rock-dunder ▪ The ideal building site is sloped, making it ideal for a walkout basement. The site's elevation offers a great southeasterly view of the lake. ▪ The building site is adjacent to a pathway that leads to the shoreline. The ideal route for the driveway ends near the building site. ▪ This property is subject to HST - to be paid by the Buyer.